Today, we’re excited to introduce a new, centralized order management experience on Science Exchange, focused on improving collaboration and messaging. We take feedback from our researchers and labs very seriously and have designed the new order management experience with your input in mind. The new design, which went live earlier today, moves messaging front and center and introduces a timeline of all events. The new workspace allows researchers and lab members to intuitively collaborate on orders. 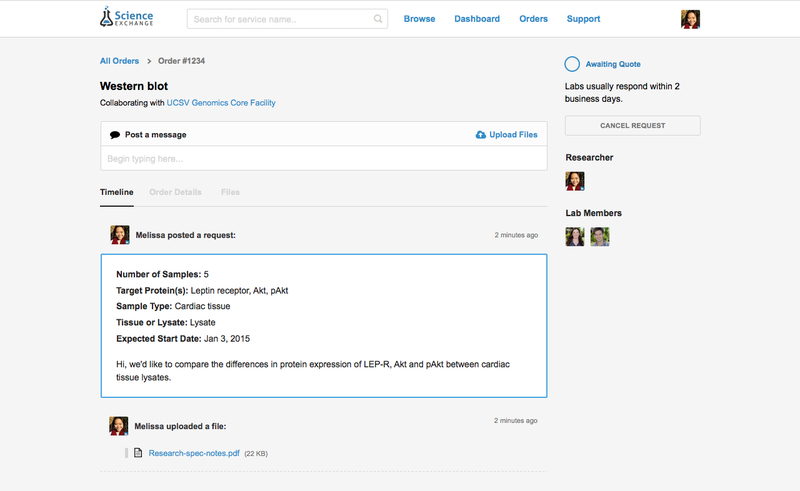 Any member of the lab can see all messages on an order, enabling multiple members of the same lab to coordinate easily and efficiently under this team view. Everyone who has access to this order is shown on the righthand side. Since open communication between researcher and lab is of utmost importance, the new order page focuses heavily on messaging. 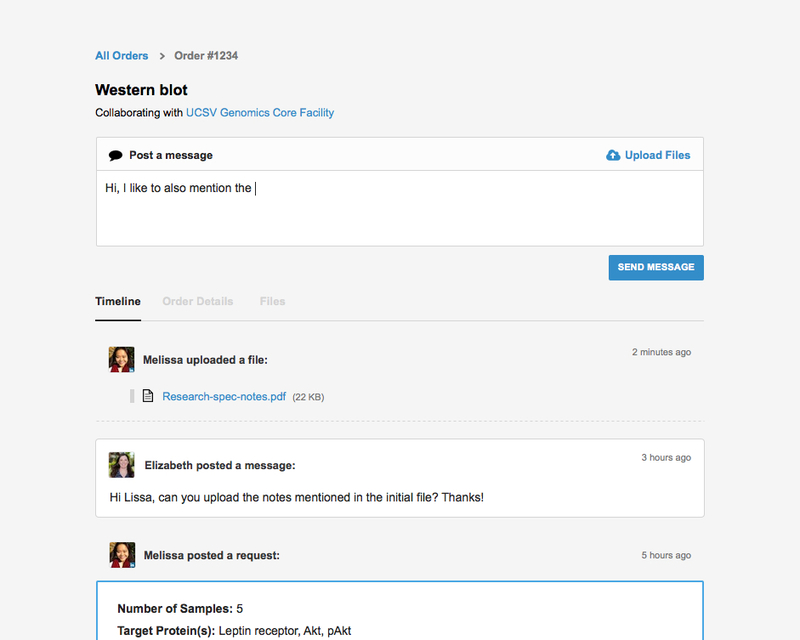 Messages and files can be sent during any stage of an order, from the top of any page. Users can start sending messages as soon as a request is posted, and continue sending them even after an order is complete. As always, there is no limit on the size or quantity of uploaded files. All messages and files appear in the main Timeline tab, along with all other events. It can be difficult to keep track of research projects, so we’ve made it easy for you. The main timeline shows everything that has happened in reverse chronological order. You can always reference the order status indicator in the upper right hand corner. All available actions, like shipping samples or accepting a quote, are shown below the indicator for easy access. Because research projects are updated regularly, we’ve added the Order Details tab. Here, you can always see the latest version of the order, no matter what state it is in. You can also download quote summaries and billing documents from the Files tab. We think you will find that the rest of your overall workflow is largely the same, just more beautiful and intuitive. As of this morning, all orders will reflect the changes. If you have any questions, please don’t hesitate to reach out to us at [email protected] or share feedback. Becca joined as Science Exchange’s first Product Manager, excited to help bring efficiency to scientific research. She previously launched SurveyMonkey Enterprise and WePay Canada. She has a degree from Stanford in Mathematical & Computational Science and enjoys cooking and home improvement in her spare time.